There is a saying that goes “Use the right tool for the right job”, and nowhere does that apply more than to the world of automotive mechanics. 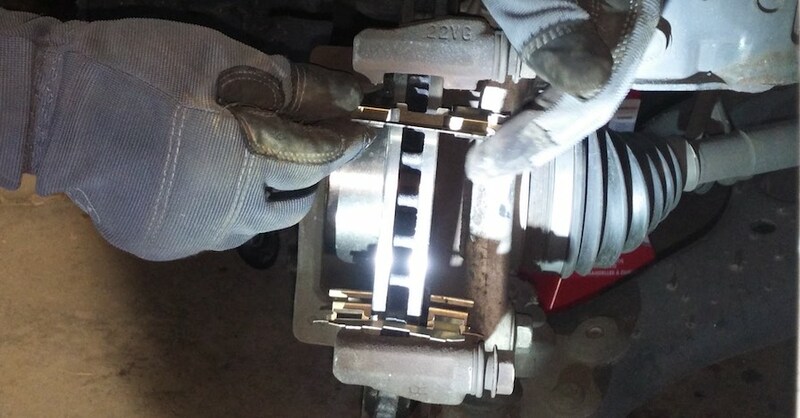 Using the wrong tool can not only make the job harder, but can create an unsafe condition and ruin your parts. Sometimes there are several tools available for one task, making it hard to figure out which is the better choice. The ball joints on your suspension is certainly one of those areas. We’re going to talk about four common types of ball joint tools that can be used to separate the ball joint from the spindle. Some of these tools are very simple, others are more complicated, and which one you use often depends on the task at hand. 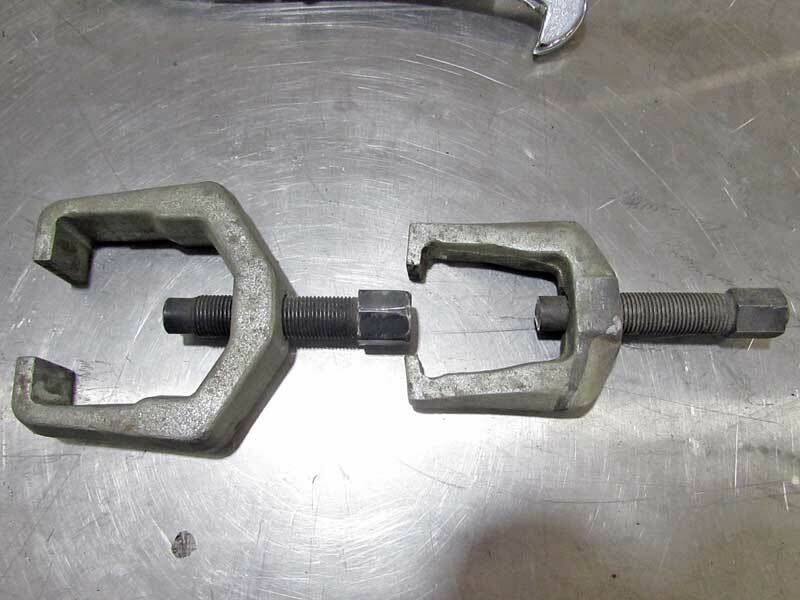 There are also a few specialty ball joint tools that are manufacturer specific, but we’ll get into those another time. 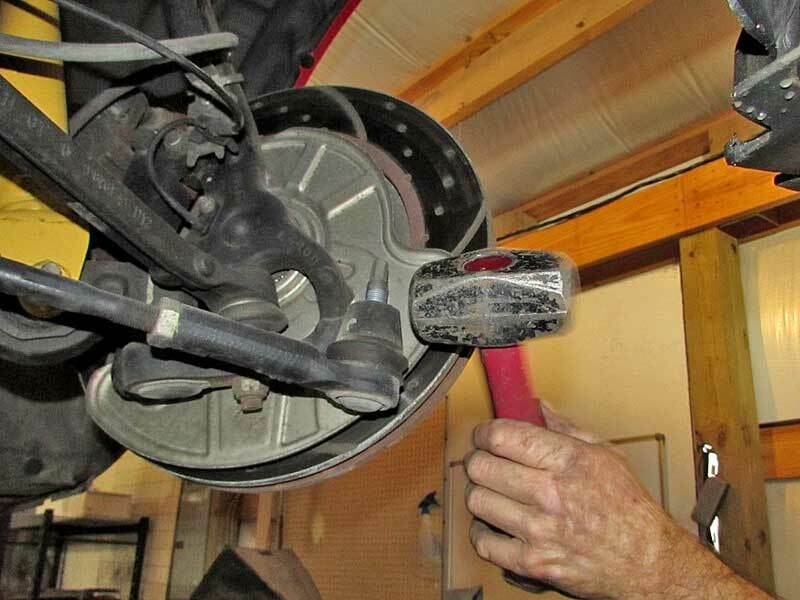 You might think it sounds crazy, using a hammer to knock a ball joint out, but it isn’t. This should be the first method you try on any newer vehicle (10 or so years on the road). The trick here is to use the hammer correctly. You DO NOT hit the stud of the joint, rather you tap the side of the spindle (where the stud slides through) with the suspension loose. If the joint is reusable, then this will save it. In most cases, the stud will simply pop out of the spindle, saving you some headaches. It depends on the age of the joint, how long it has been installed, and how clean the suspension is. The longer the joint has been in use, the more likely it is for the stud to have seized in the taper. Please note – If the suspension has pressure from a coil spring, then this is not the preferred method. 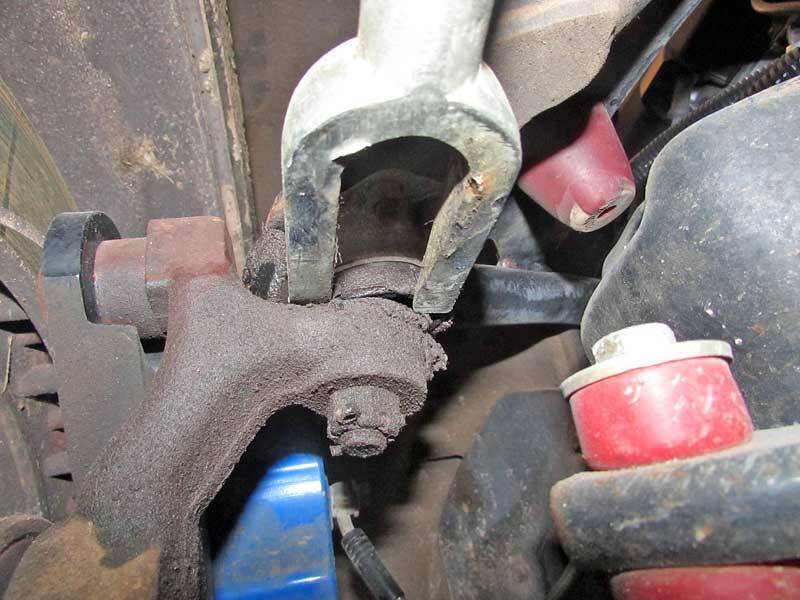 Although this image shows a tie rod end, the process is the same. 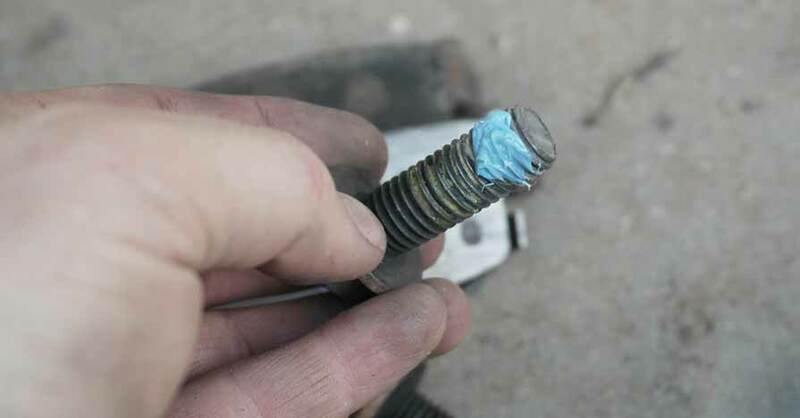 Most newer vehicles do not need an actual tool to remove the joint, in many cases, a few taps with a 3 pound hammer will shock the joint from the taper. Don’t beat on it, just a few sharp taps. If that doesn’t do it, get a tool. The most commonly known tool for separating ball joints is the pickle fork. What is essentially a long two-prong wedge, the pickle fork is also known as a part destroyer. Do not use a pickle fork on a reusable part. If you are removing the joint in order to replace or service something else, the pickle fork will only cost you more money. The reason is that you can’t save the dust boots, a fork will always rip them. If you are replacing the joint, then it really won’t matter. To use a pickle fork, simply slide it between the spindle and the control arm as tight as you can and then hit the free end with a hammer. This drives the wedge between the two points and forces the joint out of the taper. 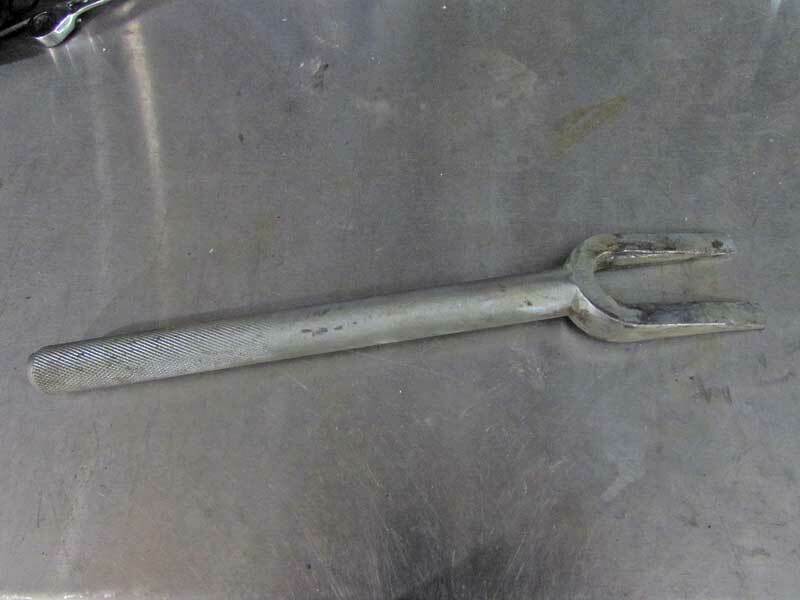 Just like it sounds, a pickle fork looks like a two-prong fork. You hit it with a hammer. Here is the fork in action. The tines go between the boot and the spindle. These will destroy the boot, so be aware. The next type of tool is a press. This is a one-piece press that has a cast or forged two-prong claw and a threaded stud in the center. More commonly used for tie-rod joints, these can be used on ball joints. They work if the joint is not seized too bad. Cheap versions tend to not fit between the spindle and the ball joint head, and they may spread apart if too much pressure is required. Another potential pitfall is damaging the threads for the castle nut on the joint stud. To avoid this, thread the castle nut on upside down (with the split side towards the joint), and then apply the press. This keeps the head of the stud centered. This can be used in conjunction with the hammer method to put a little pressure on the joint stud as well. 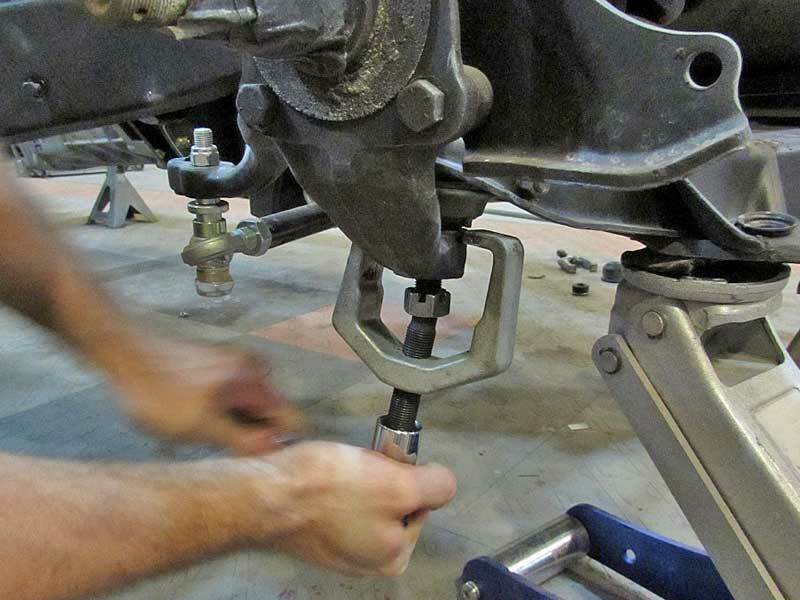 The basic claw press works for most ball joints and tie rod ends. There are multiple sizes as well. It is a good idea to put the castle nut on the stud (upside down) to keep the press stud square, otherwise, you can mess up the threads. The professional tool is the ball joint press. This is a more complicated version of the claw press. 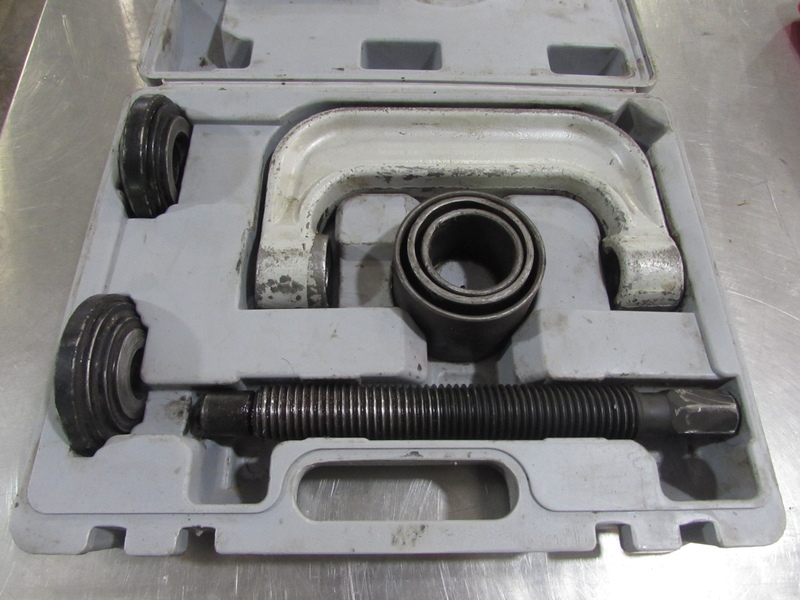 This tool uses a clamshell and adapters to ensure a clean and safe removal of the ball joint from the control arm. The joint will also remain reusable. The problem with this type of tool is that they are expensive; they typically cost a couple of hundred or more to get all the adapters. Just keep in mind that you will need to think ahead before you start your project if you need this tool. 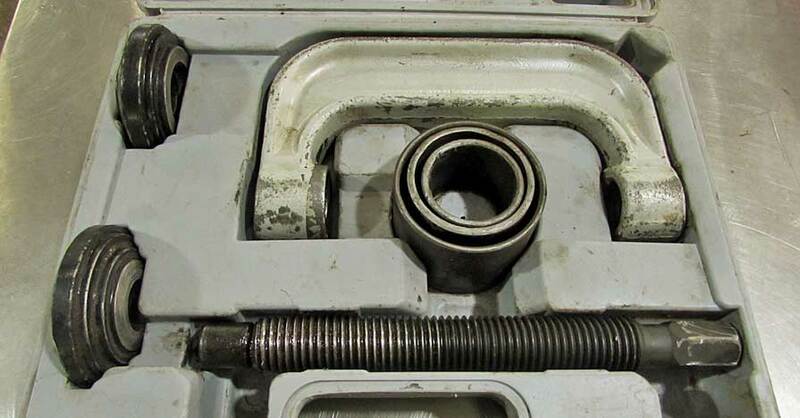 The full ball joint press is the most efficient way to get stubborn joints removed. These are pricey, which is why most folks rent or borrow them. As with any suspension work, take great care to ensure the vehicle is safely lifted off the ground, use jack stands and NEVER work under a raised vehicle with just a jack supporting the weight. 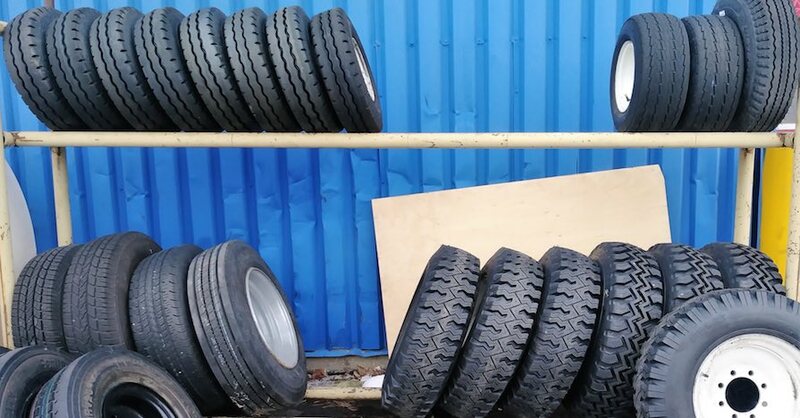 When it comes to coil springs, safety is paramount, never release the tension on a coil spring without taking the proper safety precautions first. 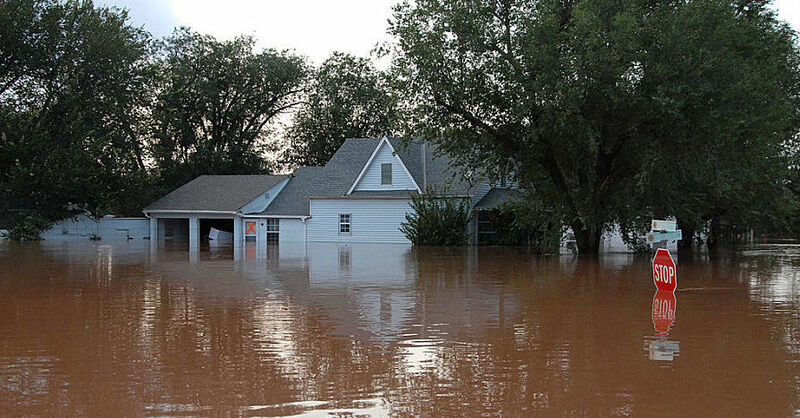 If you have any doubts, contact your local NAPA AutoCare Center and let the pros handle it. Check out all the tools & equipment available on NAPA Online or trust one of our 17,000 NAPA AutoCare locations for routine maintenance and repairs. For more information on ball joint tools, chat with a knowledgeable expert at your local NAPA AUTO PARTS store. Hi, I am trying to decide if I want to tackle the job of replacing the upper and lower ball joints on my1995 Dodge 1500 four wheel drive. It appears to be quite an operation. However, every time I pay someone to do work on it I feel that theyare ripping me off. How difficult is it for the average do it yourselfer? Thank you for your comment about your truck’s ball joints, a NAPA Auto Parts representative will be contacting you via email shortly.